Healthcare Provider Thrives with 8x8 Cloud Communications | 8x8, Inc. When healthcare services provider MHM Services, Inc. needed to replace its on-site PBX phone systems, it turned to technology solutions provider CDW and to 8x8, Inc. Two weeks after signing the contract, MHM had just one weekend to implement network services at seven prisons geographically spread across a state. To complicate matters, cell phone use is prohibited at these prisons. Thanks to 8x8 technology, the IT techs were able to call and instant message each other using their laptops, collaborating to solve issues and completing the project on time. According to CDW, outstanding products and support are why 8x8 is on their list of valued partners. MHM Services, Inc. is a leading provider of healthcare services to correctional facilities across the US. The company currently employs more than 3,000 clinical, management and support staff nationwide. Healthcare services are provided through contracts with local and state agencies, and these government contracts are managed through a network of 20 regional offices. 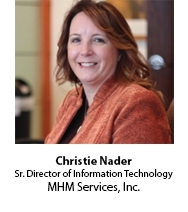 When Christie Nader, Sr. Director, Information Technology, joined MHM in 2014, each regional office had its own premises-based PBX phone system. The rationale was that this would make it easier and more cost-effective to open and close offices as contracts were awarded and ended, typically within three to five years. On paper it all made sense. But when Nader dug into the costs more deeply, she discovered that there were additional factors to consider. Maintaining all this hardware was time-consuming and expensive—not to mention a significant burden on her relatively small IT organization. Perpetual licenses continued to incur costs, even when phone service was no longer needed. And offices with long-term contracts lasting a decade or more ended up with antiquated hardware that had to be replaced. Each office also had several landlines which included per-minute long distance charges. Along with that, there were many toll-free teleconference lines used for hundreds of meetings each week with a per-minute charge for each attendee. 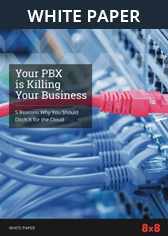 Nader realized that eliminating PBX hardware, minimizing administration costs, eliminating long distance charges and cutting telecom line costs would ultimately prove more economical for the company as it opened and closed offices across the country. In October 2014, Nader talked with a Gartner analyst at the firm’s annual Symposium/ITxpo. The analyst recommended a short list of cloud communications providers, including Magic Quadrant Leader 8x8. Nader also reached out to IT solutions provider CDW for help in evaluating systems, vendors, and prices. CDW had brokered phone systems she implemented for previous employers, and the two had a relationship stretching back more than a decade. This time when Nader asked about cost-effective cloud solutions for MHM, 8x8 was on the list of suggested vendors CDW presented. With help from CDW, Nader watched demos, evaluated equipment and compared features for several systems. Reliability, support and costs were similar across the board, but 8x8 clearly stood out when it came time to rate the user experience. “You can have the most robust phone system in the world, but if the user experience isn’t great, it’s a failure,” says Nader. Not only was 8x8’s user interface exceptionally friendly, so were its multimedia training resources, a key selling point for Nader. Eventually Nader narrowed the field to 8x8 and one competitor. While on the surface the two seemed very similar, she soon uncovered a crucial difference: only 8x8 was truly cloud-based and HIPAA-compliant. Just two weeks after MHM signed a contract for 8x8 service, the new partnership was put to the test. MHM’s technology team had to support a contract startup for a large state contract and had to quickly take over IT management from the previous vendor. This time, however, Nader’s team was not just responsible for one regional office; at the last minute they learned they had to install and manage the IT for seven geographically disperse prison locations. The situation was further complicated by prison regulations, which prohibit cell phone use on premises. The only phones available were not in the areas in which the techs were working. Nader’s team needed a way to communicate in real time from their various locations across the state. The only option they could think of was to schedule conference calls every couple of hours and have each team member dial in from any phone they could find away from their work. Luckily their new 8x8 service provided a much more effective workaround. 8x8 Virtual Office effectively turns computers into softphones, enabling voice calls without actual phones. As Nader’s team worked at the dispersed prison sites, they we were able to call and chat with each other in real time using their laptops. Following MHM’s successful initial state contract 8x8 deployment, Nader rolled out the service to her own IT team, to a few employees in the HR department, and to regional offices in Maryland and Pennsylvania. 8x8’s advanced communication features have already had a major impact on her organization. For example, the IT help desk now uses queues to manage incoming calls instead of sending callers to voicemail when the help desk cannot answer right away. 8x8’s mobile app for iOS and Android devices has also improved the IT team’s responsiveness to callers. Virtual meetings that provide face-to-face contact through videoconferencing help on board new company employees. Nader notes that recently her team “met” a new regional vice president a time zone away without leaving their premises. In order to leave plenty of time for user training, Nader plans to phase in the rest of MHM’s 8x8 deployment over the next 6 months. As MHM wins new contracts and opens new locations across the US, Nader is confident that 8x8 will evolve and grow with her organization. “Many of the systems we evaluated look almost identical because they are all based on the same open source, and are at the mercy of the same open platform,” agrees Nader. 8x8 is different. Our phone system is constantly being updated and improved because 8x8 owns its own destiny.